Everything makes its way back in style. Our bar cart is proof of that. You probably don't know this, but bar carts are one of my favorite. things. ever. to accessorize. Since I found ours I've been wanting to do a post, a little love note to how much I appreciate the care that someone took of it. Almost 50 years later it's in pristine condition, adorning the postage stamp sized space between our kitchen and living room, where a similar bar cart probably lived before, during one of our house's previous lives. This cart was a craigslist find, a mid-century classic that I was shocked to find in such good condition. It folds flat, which was one of my favorite things about it, and is the perfect mix of brass with wood. When I got it home, I sent a picture on my running family text, and my mom said "we had that cart when I was a kid!" of course she did. As she and my step-dad remind me often when they see our aesthetic, mid-century leaning choices, everything really does make its way back in style. It took us a long time to agree and find the one this gem that is now housing our beloved penguin ice bucket, and pretty bottles of St-Germaine. When I saw it pop up on the Philadelphia area craigslist, I screeched and sent Robert the link, anxiously awaiting the red light or green light. When you both have strong opinions about your house's aesthetic, you learn to pick your battles. We'd already had one too many conversations about why we did and didn't like certain bar carts, and I wasn't about to get attached to an object that he wasn't sold on. To my delight, he said as long as it was sturdy he thought it was perfect, sweet victoryyyyyyyy! This bar cart, for all intents and purposes, mostly just displays "the hits". We use that term for a lot of things around here. In terms of spirits, the hits include St-Germain and Campari, London Dry Gin and Kentucky Bourbon. We're fully embracing Negroni season, our favorite cocktail, and it helps that Robert makes a really solid one. My other go-to cocktail pretty much year-round is St-Germaine with Tito's, lime and sparkling water, lovingly named "the Jill" by Robert, sometimes if I'm feeling fancy there's sparkling wine involved as well. Forgive me while I share all of my feelings in the bar cart styling department, but I have some. I aim to have our cart look functional, minimal, and a little bit quirky. Too much clutter drives me batty, while 2 wine glasses, one pretty bottle, and one lonely flower is a level of impractical that puzzles me. Aesthetically I land somewhere in the middle of clutter and the single sad flower. Robert and I are both slightly allergic to clutter (shocking I'm sure), and when we start treating the bar cart like a catch-all for cocktail accessories, which inevitably happens... I immediately hit the reset button. It's sort of nice to rearrange occasionally, as we try new mixers, tonics, and bitters, or find different glassware or useful bar accessories. Since cocktails change seasonally, it's also great to swap in and out what you're newly leaning towards, itching to try, or has a great label. The things that will never stray far from here, regardless of how many times I rearrange? Coasters, bitters, ice bucket, my favorite gold rimmed coupé glasses, bottle opener. Our cocktail accessories are years in the making, carefully curated, and best of all they're an eclectic mix of gifts and vintage finds. It makes it all a lot more special. When I suggested we make a sparkling rosé Campari spritz with a hint of citrus to accompany this post, Robert pointed out that it was the most Jill drink ever, and it's true. 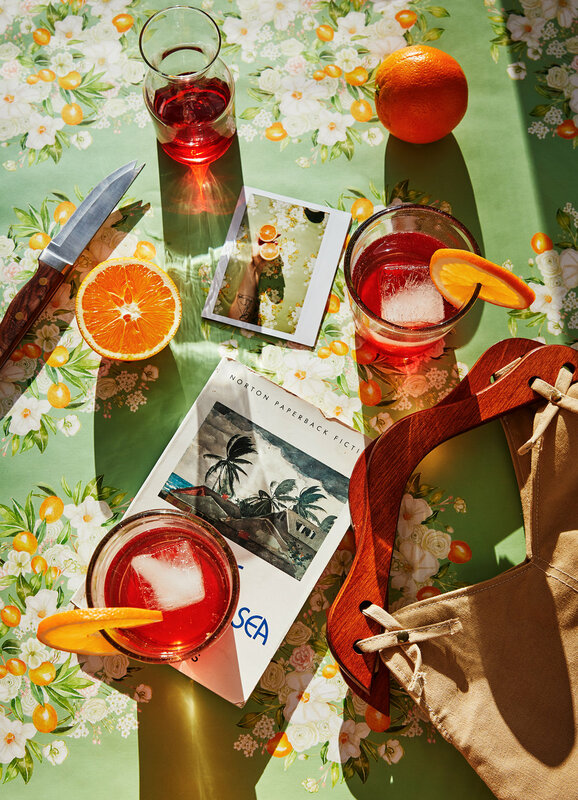 I love an Aperol or Campari spritz in the summertime, and this one is dry, bubbly, and slightly sweet, making it the perfect spritz for summer day drinks that lead into evening drinks. In a rocks glass with ice, add Campari, and a squeeze of orange juice from about 1/4 sized segment. Top with sparkling rosé, and garnish with orange wheel.